By Keith Cowing on July 25, 2017 2:58 PM. Keith's 23 July note: It would seem that the precedents set by GALEX and ISEE-3 Reboot have found resonance at NASA's Science Mission Directorate. I wonder how one might apply to take over Spitzer? Will there be a formal call for proposals, a NASA procurement notice, or some other formal mechanism to solicit ideas? If so, when? I sent a request to NASA. Stay tuned. Keith's 25 July update: According to NASA PAO: "NASA has successfully operated the Spitzer Space Telescope since 2003. Based on the most recent senior review, NASA plans to end its funding for the Spitzer mission with the commencement of operations of the James Webb Space Telescope in 2019. NASA is exploring options to continue operation of Spitzer beyond March 2019 using non-NASA funding sources, including private funding. NASA is open to discussions regarding a non-NASA funded extension of the Spitzer mission." By Keith Cowing on September 25, 2014 3:08 PM. "The ground stations listening to ISEE-3 have not been able to obtain a signal since Tuesday the 16th. Arecibo, Morehead, Bochum, SETI, as well as the Usuda 64 meter dish in Japan and the Algonquin 45 meter dish in Canada have all pointed at the spacecraft with no positive results. So, at this time we are assuming that the spacecraft has gone into safe mode." By Keith Cowing on September 22, 2014 4:09 PM. "Crowdfunding offers space organizations avenues for fundraising outside traditional institutional methods. 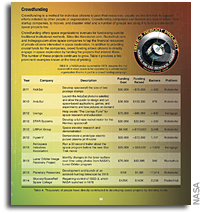 Sites like Kickstarter.com, Rockethub.com, and Indiegogo.com allow space companies to tap the financial resources of private citizens interested in space exploration. 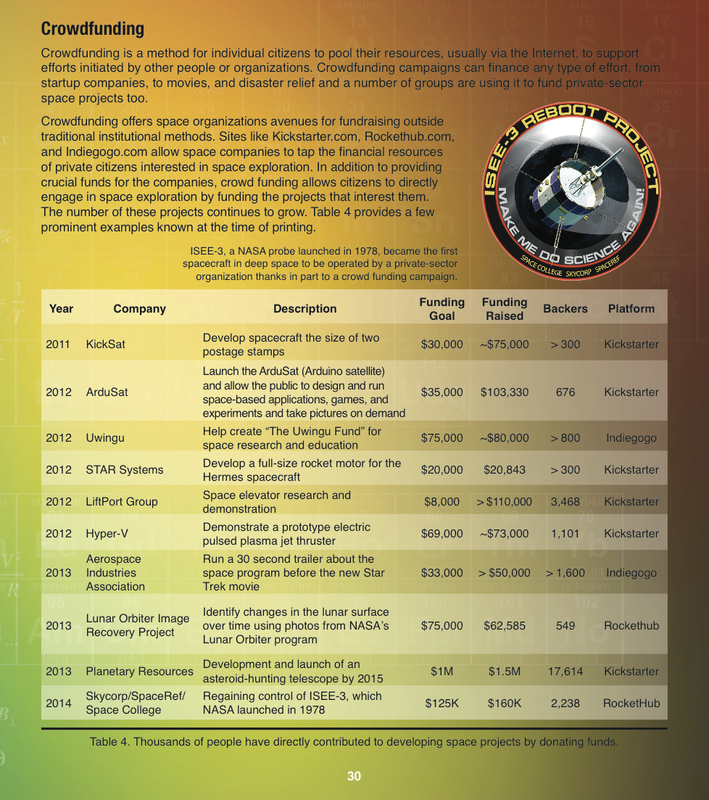 In addition to providing crucial funds for the companies, crowd funding allows citizens to directly engage in space exploration by funding the projects that interest them. The number of these projects continues to grow. Table 4 provides a few prominent examples known at the time of printing. 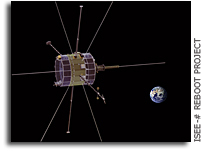 ... ISEE-3, a NASA probe launched in 1978, became the first spacecraft in deep space to be operated by a private-sector organization thanks in part to a crowd funding campaign." Keith's note: When you add ISEE-3 Reboot Project ($160K) and Lunar Orbiter Image Recovery Project ($62K) together (both conducted by the same team) over $222,000 has been raised via crowdfunding. Click on image to enlarge. Meanwhile, since its inception several years ago, CASIS has raised only $14,550 in cash. We often raised that much in a day or two. By Keith Cowing on September 9, 2014 6:59 PM. "I had guys clambering over the [radio antenna] dish in Arecibo [Puerto Rico], hanging hardware while people were still giving money, and people were saying, 'This is great!' " he says. "I was live-tweeting everything we did. Every geeky expression that happened in the control room I threw out there, and people were telling me they got in trouble for not going to work, or skipping class, sitting on the subway reading it on their phone." "The bulk of the people that give you money don't quite even understand exactly what you're going to do," says Cowing. But success comes "if you tell a compelling story, couch this in a way that there's adventure involved, but also a payback opportunity that people feel is important, that there's something to be learned." By Keith Cowing on July 24, 2014 12:51 PM. "After a successful reawakening the venerable ISEE-3 spacecraft is about to begin the first interplanetary citizen science mission. 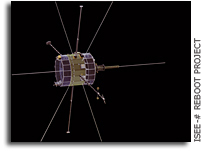 We will be beginning the "ISEE-3 Interplanetary Citizen Science Mission" on 10 August 2014 as the spacecraft flies by the Moon. We have a functional space craft that can do science and is already returning new data. All of our original citizen science objectives remain unchanged and are ready for implementation. In fact, we'll be announcing some new partnerships shortly that will serve to turbocharge our efforts in this regard." By Keith Cowing on July 18, 2014 8:32 PM. "NASA likes to say that "space is hard," but to make itself relevant to the people whose taxes fund it, it must get outside its comfort zone. To its credit, NASA saw the potential of our project to reach beyond the traditional audience. The interactions via social media with our supporters have borne this out. Imagine what feats of exploration might be possible if an empowered and engaged citizenry realized that exploring space is really something anyone can do." By Keith Cowing on July 15, 2014 2:21 PM. "In the science fiction universe of Star Trek, set several hundred years in the future, when we are a spacefaring civilization, humanity encounters a species called the Borg. The Borg are a conglomeration of species who are assimilated into a collective mind numbering in the hundreds of billions. All of the Borg are connected to each other through a communications link that allows each of them to share each others thoughts, though in a manner that erases individuality. This week, with the call that our ISEE-3 reboot team put out to the internet for help in debugging our propulsion system problem, I have come to realize that a significant portion of humanity has reached a Borg like state, one where the internet has become a collective mind for communications and knowledge sharing. We still have our individuality, we can still decouple at will from the collective mind, but in a way that few philosophers or technologists have envisioned, we are connected in a way never before thought possible. The implications are staggering, and here is how our little ISEE-3 project is an example of the operation of the collective mind." "Our next window at Arecibo is tomorrow (Wednesday) between 12:19 pm and 3:03 pm ET. During that opportunity we intend to attempt a deep space plumbing repair on board ISEE-3 and then fire its engines." By Keith Cowing on July 11, 2014 7:21 AM. "We have a crowdsourced research project for our ISEE-3 Reboot fans. One of our volunteers, Karl-Max Wagner from Germany has an interesting idea. Did the Nitrogen pressurizing gas dissolve in the Hydrazine in the tanks?" Update: We spent all day yesterday with space propulsion experts. We have identified a series of options including hydrazine tank heating and a long series of pulse attempts to (possibly) clear the lines. We have most certainly not given up on this spacecraft yet. It is doing science and will continue to do so for years to come. By Keith Cowing on July 9, 2014 8:32 PM. "Our troubleshooting today eliminated some suspected causes of propulsion system problems. We do not think any of the valves are malfuctioning. Right now we think there is a chance that the Nitrogen used as a pressurant for the monopropellant Hydrazine propulsion system may have been depleted. That said, we still have a number of troubleshooting options yet to be explored. We have a DSN pass scheduled for Friday that will allow us to recalibrate our location information and trajectory plans for ISEE-3. Even if the L-1 halo orbit is no longer an option, we do have plans to use ISEE-3 for science in other locations within the inner solar system after the lunar flyby on 10 August." By Keith Cowing on July 8, 2014 10:59 PM. "The first part of the maneuver succeeded, a milestone in an effort to resurrect a zombie spacecraft that NASA abandoned 17 years ago. But then -- perhaps to be expected during work on a jalopy -- problems cropped up, and the thrusters failed to fire properly. Another attempt to complete the course correction will be made Wednesday. "I feel like it is taunting us sometimes," Keith Cowing, one of the leaders of the effort, said of the 36-year-old spacecraft, the International Sun-Earth Explorer-3, or ISEE-3. It is not NASA commanding the spacecraft now, but a group of civilians working in a former McDonald's in California taking advantage of technological goodies of the 21st century, including Skype, Twitter, laptop computers and crowdsourcing." By Keith Cowing on July 8, 2014 8:38 PM. "If all goes according to plan on Tuesday, 8 July, we will conduct the Trajectory Correction Maneuver (TCM). This will require a much longer firing of the spacecraft's thrusters. Our window at Arecibo opens at 12:42 pm EDT and extends until 3:29 pm EDT. If the burn is a success we will follow up with another ranging session using the DSN to get an exact measure of the spacecraft's position, trajectory, and speed. After that we should be good to go for our lunar flyby on 10 August. After the last technical tag-up for today it looks like TCM will be 432-435 pulses fired in 7 segments with a total delta V of approximately 7 m/sec." Keith's update: We managed to conduct the first segment but encountered problems with the second and halted the remainder of segment firings. We're looking at data and formulating a plan for tomorrow. By Keith Cowing on July 7, 2014 11:08 AM. Keith's 2 July note: We just fired the engines on ISEE-3 to perform a spin-up burn. Preliminary results confirm the burn and a change in rotation. The spin rate was originally 19.16 rpm. It is now at 19.76 rpm. The original mission specifications call for 19.75 +/- 0.2 rpm - so we are exactly where we wanted to be. By Keith Cowing on July 3, 2014 8:37 AM. "Ed Smith, Original Original Principal Investigator on ISEE-3 Vector Helium Magnetometer: The effort to recapture the ISEE-/ ICE spacecraft has just achieved a notable scientific success. Data recovered from the spacecraft very recently show that the magnetometer is not only operating well but has observed a large rapid change in the Interplanetary Magnetic Field/IMF." By Keith Cowing on July 1, 2014 8:35 PM. Keith's note: We were able to use the B transmitter today for the first time but were unable to complete the various steps needed to command ISEE-3 to fire its engines. There is a chance of a window at Arecibo tomorrow. Meanwhile, the first scientific measurements by ISEE-3 in decades have been obtained. Recent magnetometer data from ISEE-3 shows clear evidence of a recent solar event. We will be releasing more information on these observations very soon. By Keith Cowing on June 27, 2014 4:27 PM. Keith's 26 June Update: Just as our DSN window closed today we were able to get 2 way Doppler lock and ranging at a 47.5 kHz offset. DSN got the four ranging points needed from ISEE-3. This is the first time since 1999 that DSN has talked to the spacecraft. A follow-up session tomorrow should get us a lot more recording time. Hats off to the DSN guys - especially the folks at DSS-24. Keith's 27 June Update: We had an even greater DSN pass today with ISEE-3. We managed to get ~30 minutes of data (11 range points) after achieving 2 way Doppler lock and ranging at a 47.5 kHz offset. By Keith Cowing on June 25, 2014 4:30 PM. "During our session with Arecibo today we came very, very close to firing the thrusters on ISEE-3 for its spin-up maneuver. But we were not able to complete the process and fire the thrusters. The spacecraft was completely configured for a thruster firing during today's pass. We reduced the number of pulses from 11 to 1 to make certain that we had the proper commands in place. If that engine firing proceeded successfully we'd follow with the remaining 10 pulses so as to spin up the spacecraft to the required rotation rate. As it happened we were unable to get confirmation on the very last command and put a halt to the procedure." Keith's note: We have another window opening at Arecibo around 1:30 pm EDT. We'll be live tweeting at @ISEE3Reboot. Keith's Update: Our Arecibo pass was a short one and we had some commanding issues - so no spin-up burn. Our DSN pass for ranging starts at 4:50 pm EDT - you can see ISEE-3 listed on the DSN live page. By Keith Cowing on June 23, 2014 10:01 AM. "The DSN pass last week on 18 June that went from 1:45 to 2:45 Pacific Daylight time was not a success. Here is a recap of the pass activity. ... Friday June 20th we were going to do the propulsion system test and spin up maneuver. However, one of our pass/fail criterion was real time telemetry and reliable commanding. Neither of these criterion were met and thus we cancelled that activity early in the pass." By Keith Cowing on June 20, 2014 9:07 PM. "Once the ISEE-3 campaign was launched and promoted by Sky Corp and Space Ref Interactive, 2,238 supporters weighed in, raising $160, 000, $35,000 more than the project's goal. The project went from the improbable to the practical, and this is the transition on the forefront of every entrepreneurs mind. How can you do the same? ... Is this the path for you and your company? It could well be if you can meet the market with the thrust of the ISEE-3 campaign. If you can, your charity, reward or equity funding has a good chance of achieving liftoff." By Keith Cowing on June 20, 2014 3:13 PM. By Keith Cowing on June 18, 2014 5:57 PM. Keith's update: We did not have any luck establishing two-way communication between ISEE-3 and DSN today. We'll regroup and try again on Sunday. This does not affect our plan to do a short series of engine burns on 21 June (Saturday) to spin up the spacecraft. By Keith Cowing on June 15, 2014 10:00 AM. "We have received confirmation from NASA that we have been confirmed for time on the DSN (Deep Space Network) for two-way Doppler and ranging activities with the ISEE-3 spacecraft. This is being done so as to determine the location of ISEE-3 with great precision for navigation purposes. Based on this data we will conduct our course correction engine firing. We have moved that original firing date from 17 June to a window that currently covers 30 June and 2 July." "After 36 years in space, the craft, the International Sun-Earth Explorer-3, appears to be in good working order. The main challenge, the engineers say, is figuring out how to command it. No one has the full operating manual anymore, and the fragments are sometimes contradictory." "NASA has given us approval to fire the spin thrusters on ISEE-3 to increase its spin from 19.16 rpm up to the mission specification of 19.75 +/- 0.2 rpm." By Keith Cowing on June 9, 2014 1:37 PM. By Keith Cowing on June 8, 2014 8:20 PM. "Viljo Allik, ES5PC, a member of ESTCube-1 student satellite team at Tartu Observatory, Estonia writes: "I did some receiving experiments today, both on 2217.5 MHz LHCP and 2270.4 MHz RHCP. The RHCP carrier is a few dB-s stronger than LHCP. Up to 10 dB carrier to noise can be seen in 1Hz bandwidth with my 4.5 m moonbounce dish at home and G4DDK preamp." @eb3frn #ISEE3 4Hz in 30 minutes spin observed in the signal recorded today with doppler compensated. By Keith Cowing on June 6, 2014 12:20 PM. As many of you have probably read, the ISEE-3 Reboot Project was able to successfully send uplink commands to the space craft. This was accomplished through a lot of team work, strong leadership by Dennis Wingo, and generous support from the community at large. Balint Seeber and I were fortunate enough to work on the communications for this project. When you tell most people that you designed a deep-space uplink modulator in a couple of days, there is a good chance that they will be fairly impressed. By Keith Cowing on June 6, 2014 12:07 AM. This is the moment of First Contact with ISEE-3 last week at Arecibo. Austin Epps is on the left, Balint Seeber (doing the happy dance) is on the right. Dennis Wingo (on the phone) was up in the dome on the dish. Meanwhile, Keith was in his basement office answering media inquires while watching this all live via Skype, but he still took time out for his own happy dance. "We are doing a receive run - NOW - from Arecibo controlled via laptop from ISEE-3 Mission Control at McMoons in northern California. Taking data received on 29 May 2014, we have performed demodulation, error correction, and frame construction. Approximately 1,000 frames of telemetry have been received and processed. 773 Frames were received with no errors. More telemetry processing is currently underway." "We have received authorization from NASA to communicate with (and command) ISEE-3 until 25 June. Meanwhile, analysis of telemetry from ISEE- 3 shows that *ALL* of its science instruments are still powered on. Telemetry also shows that ISEE-3 has a power margin of +28 watts - after 36 years. It is important to note that ISEE-3 has not had a functioning battery for decades. Indeed, this power capacity is what was projected for the spacecraft to have had in 1982 after 4 years in space." By Keith Cowing on June 3, 2014 2:08 PM. "Telemetry we have received from ISEE-3 shows that it is spinning at 19.16 rpm. The mission specification is 19.75 +/- 0.2 rpm. We have also learned that the spacecraft's attitude relative to the ecliptic is 90.71 degrees - the specification is 90 +/- 1.5 degrees. In addition, we are now receiving information from the spacecraft's magnetometer." By Keith Cowing on May 29, 2014 4:11 PM. "The ISEE-3 Reboot Project is pleased to announce that our team has established two-way communication with the ISEE-3 spacecraft and has begun commanding it to perform specific functions. Over the coming days and weeks our team will make an assessment of the spacecraft's overall health and refine the techniques required to fire its engines and bring it back to an orbit near Earth." "We have successfully commanded both of ISEE-3's data multiplexers into engineering telemetry mode. The current bitrate is 512 bits/sec. We have been able to verify modulated data through ground stations in Germany, Morehead State in Kentucky, and the SETI Allen Array in California." Keith's note: 34 years before the ISEE-3 Reboot Project there was another attempt to raise private funds to operate a retired NASA spacecraft - Viking 1. It was called "The Viking Fund." Never heard of it? Here's a story from 1980 that explains what they did. Sound familiar? I was involved. So this whole idea is not exactly a new one to me. The person behind all of this was Stan Kent. "The initial contact was a tone followed by specific commands," project organizer Keith Cowing told NPR's Nell Greenfieldboyce by email. "We learned a lot simply by being able to talk to it and get it to do things. "May not sound like much but that was a huge unknown," he adds." Continue reading Communication Has Been Restored With the ISEE-3 Spacecraft . By Keith Cowing on May 28, 2014 10:20 PM. By Keith Cowing on May 28, 2014 10:07 AM. Keith's note: We have had the ability to contact the ISEE-3 spacecraft since last Friday. All hardware is in place at Arecibo and has been tested end-to-end. We are now awaiting authorization to proceed from NASA. First Contact can then happen almost immediately once our window opens. Every day we delay shortens the time available to contact the spacecraft and begin the process of understanding its condition and verifying our ability to command it. The longer we wait, the more fuel and thrusting time will be required. This will soon become a critical factor as we get into the month of June. Given that the spacecraft is not where everyone thought it would be, the possibility of a lunar impact cannot be discounted. Yet another reason why we need to make First Contact ASAP. By Keith Cowing on May 25, 2014 6:08 PM. "The error in position has just elevated the concern level greatly. We know approximately what the offset error is from the existing ephemeris but we don't have enough information yet to plot a new course and generate a new ephemeris file. This has become extremely important as there is a solid statistical chance that the spacecraft could impact the moon or even be off course enough to threaten other spacecraft in Earth orbit." "A first of its kind mission to wake up a sleeping satellite is underway. As Mark Albert explains, Keith Cowing and a team of 20 convinced NASA for the first time to turn over the satellite to a group of space enthusiasts." By Keith Cowing on May 23, 2014 9:50 PM. Keith's note: Our ISEE-3 Reboot Project crowd funding campaign just ended. We raised $159,502 - 128% of our original goal. Time to wake up a disco-era spacecraft and make it do science again! By Keith Cowing on May 23, 2014 12:52 AM. "NASA has given a green light to a group of citizen scientists attempting to breathe new scientific life into a more than 35-year old agency spacecraft. 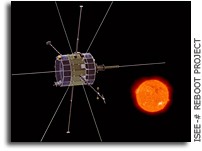 The agency has signed a Non-Reimbursable Space Act Agreement (NRSAA) with Skycorp, Inc., in Los Gatos, California, allowing the company to attempt to contact, and possibly command and control, NASA's International Sun-Earth Explorer-3 (ISEE-3) spacecraft as part of the company's ISEE-3 Reboot Project. This is the first time NASA has worked such an agreement for use of a spacecraft the agency is no longer using or ever planned to use again. The NRSAA details the technical, safety, legal and proprietary issues that will be addressed before any attempts are made to communicate with or control the 1970's-era spacecraft as it nears the Earth in August." Keith's note: We have passed our initial $125,000 goal - and our $150,000 'stretch' goal. First Contact with ISEE-3 is imminent i.e. hours/days. Please consider helping this project at http://rkthb.co/42228. Asked if the goal was to resume science or just prove that it could be done, Cowing said "it's both." "Why not try it? We told people up front it's iffy, and we've gotten over $150,000 now from people and they knew exactly what the risk was. And, it's cool. The factor that's motivated a lot of people is 'why not?'" As for the potential science, "we're going to do our best to make sure whatever comes back from that spacecraft is on line as fast as we can get it online, that it's open to anyone." If there was any doubt about whether modern Americans were still enamored with space, the results of their crowdfunding campaign squash it. The group blew through their $100,000 goal, and are currently getting close to a $150,000 stretch goal. There are only two days left to donate--and you should--but the fact that they've raised so much money in so short a time is remarkable. By Keith Cowing on May 19, 2014 11:22 PM. "The following are screenshots of data from the live receive session we did with our Ettus Research Software Defined Radio unit attached to the Arecibo antenna today (19 May). "Waterfalls" were generated by post-processing the recorded data. There are four recordings of various lengths as we were testing the setup, and this is the very, very initial result." Keith's note: The ISEE-3 Away Team is onsite at Arecibo: Dennis Wingo, Balint Seeber, Austin Epps. A month ago when we started (14 April) we had $0.00. Today the team is installing hardware on the antenna. Now that we've passed our initial goal of $125,000, we have asked for an extension to our crowd funding effort - a "stretch goal" of $150,000. As we developed the software, hardware, and procedures needed to contact and command the ISEE-3 spacecraft, it became clear to us that getting additional information on the precise location of the spacecraft was of great value. The best way to do that is to use NASA's DSN (Deep Space Network). Since NASA is not funding our project, we'd need to pay them for this activity. Based on the time we'd need to use the DSN, $25,000 is a very good estimate. We're already close to $132,000 $135,000 $136,000 $143,000. So, if you have not yet donated, here's your chance. First Contact will occur very soon (we hope) within the next week. Please consider helping this project at http://rkthb.co/42228. By Keith Cowing on May 15, 2014 11:50 AM. "Today's update regards the progress of the ISEE-3 Reboot Project team in our preparations to contact the spacecraft. We started this effort 32 days ago on on April 12, 2014. Below is what we have accomplished in that time - and the challenges that lie ahead. Perhaps the toughest part of doing something like this in a very limited timespan is to climb the learning curve - and to do so with a spacecraft you knew very little about. Early on we did a preliminary evaluation of the spacecraft and its systems so as to better understand it. This was a long jump into deep water. As we did with our Lunar Orbiter Image Recovery Project (concerns the 1960s era Lunar Orbiter spacecraft) the search for ISEE-3 documents has been intense and not without failure." "Ettus has volunteered to help with the programming, and one member of the company will join Wingo in Arecibo. They'll set to work there on 19 May, using a 400-watt transmitter shipped in from Germany to try to make contact with the spacecraft." By Keith Cowing on May 14, 2014 8:00 PM. "A pair of space geeks quarterbacking an effort to bring a derelict NASA spacecraft back into orbit around Earth expect NASA on May 13 to legally bless their privately funded project to recover and restart the 36 year-old International Sun/Earth Explorer-3. "We expect the Space Act Agreement to be signed tomorrow," Dennis Wingo, president of Moffett Field, California-based Skycorp Inc. wrote in a May 12 email. " Keith's note: We just passed the $116,000 $117,000 $118,000 $120,000 $121,000 $125,000 point in our crowd funding campaign. There is still much more yet to be done on this bare bones effort. First Contact is very soon. Please consider helping this project at http://rkthb.co/42228. By Keith Cowing on May 11, 2014 8:57 AM. Keith's note: We just passed the $112,000 point in our crowd funding campaign - 90% We started 27 days ago with nothing. We still need to reach $125,000. Please consider helping this project at http://rkthb.co/42228. On 10 August 2014 we'll be flying less than 50 km over the lunar surface. Join us. By Keith Cowing on May 6, 2014 8:00 PM. "In 2014 this venerable spacecraft returns to Earth's orbit and our primary objective is to regain control of the spacecraft and command its engines to fire on a trajectory that will result in a capture into a permanent Earth orbit. Following this, we hope to return the spacecraft to science operations, using its instruments as they were originally designed. The data from the spacecraft will be open to the public and will be used by the heliophysics community and will be a tool for teaching operations and science data gathering from a spacecraft by students and the public. In the following sections we will detail the engineering objectives of the project until it is in its final Earth orbit." By Keith Cowing on May 1, 2014 5:47 PM. "Today is May 1, 2014, the 17th day after we started our RocketHub project to raise $125,000 to allow us to attempt to contact, evaluate, and command the International Sun-Earth Explorer-3 (ISEE-3) spacecraft to fire its engines in such a way as to return it to Earth orbit after a swing-by of the Moon on August 10 2014. Today I want to discuss some of the technical issues and hurdles that we face in bring this spacecraft back into a stable Earth orbit. I am leaving out the experiments for the time being as we have to focus on the engineering required before we get to that part." 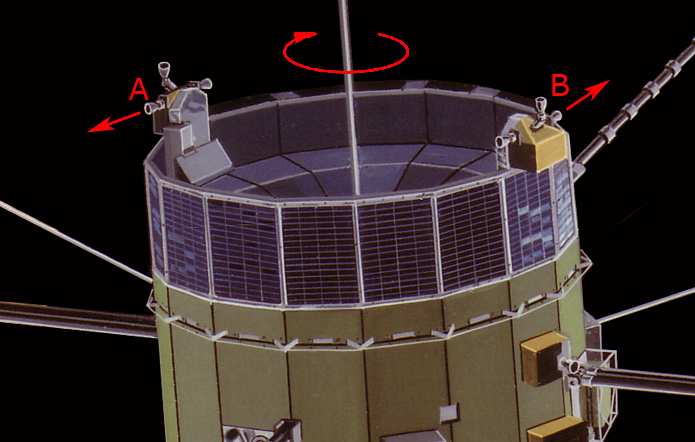 Continue reading ISEE-3 Reboot Project Technical Update. This page is an archive of recent entries in the ISEE-3 category. Internet Policies is the previous category. ISS News is the next category.